Your restaurant hood system controls the ventilation in your commercial kitchen and keeps grease buildup to an absolute minimum. If your vent hood system is not properly maintained, all that grease, debris, and other dirty materials can get kicked into your kitchen’s atmosphere, leading to foul odors permeating your otherwise family-friendly environment while increasing the risks posed by dangerous and deadly fires. Proper maintenance of your systems is key to protecting what’s so very important. Here is all you need to know about vent hood cleaning from time-tested professionals. When discussing proper restaurant hood maintenance, it’s important to know about each individual component. These are the elements that will need to be thoroughly cleaned and inspected to ensure proper maintenance is performed. These components are otherwise referred to as exhaust or range hoods. They’re those devices that look like chimneys and hang over the stovetop. Inside the extractor hood is a fan that works to remove all those contaminants that tend to appear in a commercial kitchen, like grease, odors, smells, smoke, and steam. Along with the cleaning and maintenance of the extractor hood, the grease traps of the establishment should also be cleaned thoroughly. Also inside the extractor hood lies the hood filter, which also captures airborne particles. Without the filter in place, all those particles would just be kicked back into your kitchen and the air your staff and customers breathe. In many cases, extractor fans will be located within the hood, but that’s not always the case. The fans are tasked with removing old and contaminated air from your kitchen, whereby the stale air will be vented outside and away from the building. These fans are responsible for proper ventilation, which keeps your kitchen at the proper temperatures and limits the risk of fire. Otherwise known as grease ducts, these components take the grease, vapors, fumes, and other nasty contaminants outside and away from the building, usually from the rooftop. When grease accumulates enough, it can get onto and negatively affect the integrity of your restaurant’s roofing. Too much grease can lead to water leaks and fire hazards, just to name two. This means that a rooftop containment system is necessary, as is the maintenance of such a device if you hope to protect your investment. Within the rooftop containment system, you will find a grease runoff system along with a grease trap. These must be emptied out regularly to prevent grease overflow. Ensure the system is waterproof, as well, since rain getting into the grease trap can cause eventual flooding. Your ventilation hood system may contain different parts than the ones listed here. 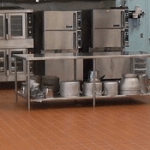 However, the basic concepts will be similar, no matter what type of system your restaurant employs to keep grease and other contaminants at bay. Check with the manufacturer of your vent hood components to get actual figures and dates for proper restaurant hood maintenance. However, the following checklist should give you an excellent guideline to follow. Scheduling and hiring a crew to maintain your hood system is critical for your business. Here are just three reasons to convince you. When your stove hoods are cleaned and maintained on a regular basis, a professional crew can look for faulty components during every scrub down. You want detail-oriented hood maintenance personnel watching out for your kitchen equipment, which you likely spent big money on. Regular maintenance cuts down on unnecessary repairs and any downtime that may occur if a breakdown happens and you were otherwise completely unaware. With the expense of owning and maintaining kitchen equipment, you want the most out of each machine and appliance you operate. Proper maintenance ensures there’s no grease build-up that can muck-up even the most powerful of machinery. You’ll keep your fans, vent hoods, and ducts operating at peak efficiency, which has the added benefit of contributing to more energy savings. Even well-maintained equipment will need to be replaced ten, fifteen or twenty years down the line. New and better equipment will have been developed by then, so it makes sense that you’d want to remain current with all technology. Not maintaining your equipment, however, can actually shorten the life of your equipment, adding to your expense. 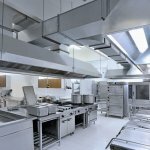 You can get peak efficacy and longer life out of all commercial kitchen vent hoods and related equipment by employing professionals who are experienced in restaurant hood maintenance. 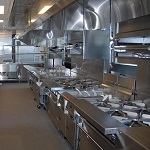 Here is the schedule the professionals at APS-Hoods.com recommend for the average commercial kitchen establishment. By engaging in the proper maintenance of your restaurant hood system, you will lower the risk of fire. 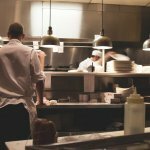 The National Fire Protection Agency (NFPA) recommends monthly, quarterly, semi-annual and annual inspections, depending on the volume your restaurant is accustomed to producing. 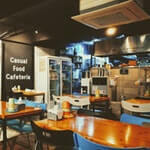 Heavy volume restaurants, for example, such as 24-hour establishments, require quarterly maintenance schedules. Meanwhile, low-volume cooking operations, like day camps and churches, can get away with vent hood maintenance checks once per year. 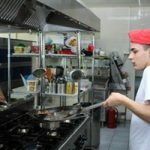 You can enhance the output and life of your kitchen equipment by making a maintenance schedule part of your staff’s nightly closing protocols. While kitchen staff is mopping floors and cleaning dishware, your personnel can also follow a daily vent hood maintenance checklist. A ventilation hood daily maintenance checklist would begin with the removal of all hood filters. The filters should be soaked in a sink or moved through the dishwasher until all buildup has been removed. All stainless-steel surfaces should be wiped down carefully so that no hard surfaces scratch any of the appliances. The cleaner’s job should be to remove all accumulated grease, especially on those surfaces comprising the ventilation hood system. Using a detergent solution, the vent hood system, including the extractor hood, should be wiped down until cleaned thoroughly. A rinsing cloth should then be used, followed by a dry cloth to remove any excess liquid. If this schedule can be maintained on a nightly basis, you’ll save more at the meter while getting the most out of your vent hood equipment, contributing to your business success. Each month your business should be in the habit of disposing of any contained grease. Check with your local city to ensure you’re following the proper and legal methods of grease disposal. After the grease has been disposed of, check the container for potential leaks. When you become accustomed to checking for leaks and other defaults on a monthly basis, you cut down on a number of business hazards, including the risk of fire. Your rooftop containment system will need to be checked monthly, as well. This ensures that there is no grease buildup on the roof, which we have already established can be detrimental to your investment. Your duct systems will also be checked for grease buildup and mold growth. 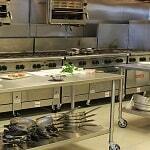 A deep clean by a professional restaurant hood maintenance crew is recommended every three or four months. During this cleaning, your vent hood systems will be scrubbed with powerful agents that will simultaneously protect your equipment. The crew will pay special attention to your ducts, grease traps, fans, and filters. The latter will be soaked in heavy degreasing agents or completely replaced to ensure optimum equipment efficiency. A professional crew will also check the bearings in your fans to ensure they are well-lubricated. If the bearings do require lubrication, grease will be added to ensure the fans replace the bad air in your establishment as needed. The crew will clean your vent hood system from roof to kitchen and every inch of duct in-between. The crew will inspect the wiring, fan components, and hood filters to identify potential issues before they get out of hand, leading to potential business shutdowns. During a yearly restaurant maintenance inspection, the professional crew will inspect your belts, bearings, and grease. If something needs to be replaced, this is the time to get it done. Why Can’t Staff Perform the Monthly, Quarterly & Yearly Maintenance Checks? Many business owners, in an effort to save money, ask why their staff can’t perform the necessary maintenance checks. It is possible for staff to do all the degreasing and other dirty work, but you’re putting your business at a distinct disadvantage by trying to cut costs. For one, your staff may not know how each of your vent hood components work. And with how intricate some of those systems can be, only knowing how they all work together can someone properly clean the systems for optimum health and safety. In order to clean your restaurant vent hoods and all associated components properly, your entire system should be taken apart. Grease, soot, and debris can hide in the unlikeliest of places, which means that buildup can occur without you realizing how bad it’s getting. The result could be equipment slow-down, breakage, or a dangerous grease fire. A maintenance crew will disassemble all pieces to check for and clean grease. All mounted fans will need to be removed in order to clean the shroud and blades of each unit. The fans and their individual components will then be inspected to determine if any blades are loose or belts are worn out. Most of all, every aspect of your vent hood wiring will be inspected to check for frays or otherwise search for problems. A faulty wire could cause your fans to break down. In worse cases, a frayed wire could cause the outbreak of fire. Each vent hood and fan component, along will all other stainless-steel appliances, will be thoroughly cleaned until all grease is removed. Even a light sheen of grease could pose a problem down the line. When the cleaning and maintenance crew is finished, you should be able to run a finger along any stainless-steel area of your kitchen without feeling the slightest hint of grease. If your staff aren’t keen on cleaning your restaurant’s duct-work, all that grease buildup can lead to contaminated air and deadly fires. Moisture accumulation can also cause mold to grow, putting your staff and customers at further risk. A maintenance and cleaning crew will polish your ductwork so that it’s free of grease and looks as clean as it is. A professional crew will sometimes provide you with before and after photos that prove that your ductwork has indeed been cleaned thoroughly and on-schedule. Most if not all companies will provide you with a certificate showing that your ventilation system has been systematically dismantled, scrubbed, de-greased, and maintained. You will have dates and signatures that you can then show to health and fire inspectors. 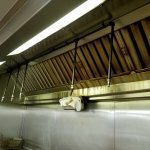 Do You Have a Professional Restaurant Vent Hood Maintenance Company in Mind? 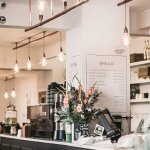 As a business owner, you have a ton invested into your restaurant and the appliances that produce the food that in turn keeps your customers happy. The health of your equipment can spell the difference between business success and one that bleeds money. When you allow grease to build up and equipment to run faulty, you run the risk of breakdowns, business delays, and business-destroying fire. You also put your staff and customers at risk. 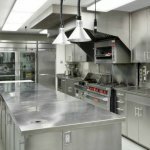 A professional restaurant hood maintenance crew like APS-Hoods offers impeccable service, the ability to remove grease from every hood component, and peace of mind that comes from knowing that your business is always protected. When you want to maintain a restaurant maintenance schedule you can always count on, contact APS-Hoods in Denver, Aurora, Lakewood, and Centennial, Colorado for a free quote.